The Wills and Succession Act: What Is New? Supplemental Information and Materials to the Court of Queen's Bench Submission "Enabling Access and Quality - Proposal for an Increase to Alberta's Queen's Bench Complement." Waiver of Tort: What is It and When Should you Plead It? The Barrister magazine is a valued benefit of membership in ACTLA and has gained praise from both the Bench and the Bar. The Barrister features current topics, practise notes, law digests, book reviews and a variety of articles on topics of interest to the civil litigators. The Barrister is a benefit of ACTLA membership, however, subscriptions are available to non-members. 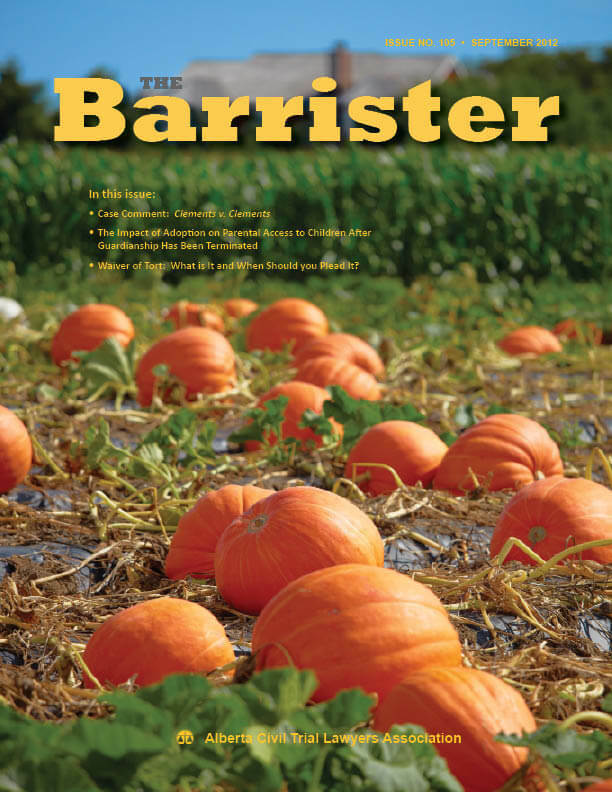 Feature articles from past issues of The Barrister are found in The Barrister Archives. The Barrister is published four times annually, in March, June, September and December. The copy deadline is the 15th day of the month preceding publication. For advertising rates and requirements, click here. ACTLA welcomes submissions to The Barrister. Authors should contact the ACTLA office for information regarding technical requirements and guidelines.